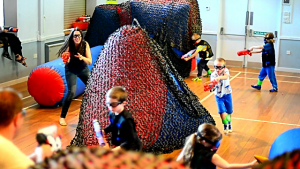 Dart Tag and Foam Ball is much safer, more fun than both paintball and Air-soft (BB) and it is chosen as a much better party alternative then Laser Quest with a huge following in the UK. There is no pain involved in Dart Tag or Foam Ball and children as young as 6 can have fun in our Mega Blaster Freestyle World. NERF Blaster fun is the leading children’s, safe play, fun game that even adults cannot fail to play and love. We do nearly as many adults events/parties with the NERF Blaster theme as children and this is now proving very popular for 18+ parties and Stag & Hen Party scenarios……..no pain, no welts and no mess to the Bride or Groom! We also now have NERF Rival Blasters which takes the fun to another level for the 10+ age group with blasters that fire foam balls twice the distance of traditional NERF blasters, it is the next step towards that jump up to Paintball for all children over the age of 10……..exciting times for children who love to play NERF style games and even more opportunities for adults to enjoy this type of harmless fun. 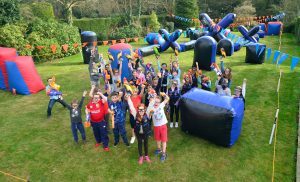 We call NERF Rival ‘Mega Ball’ and this style of NERF Blaster fun will be launched in May Half term 2016…..watch our NEWS page for more details. Our initial thoughts on this ‘new style of NERF Blaster Party’ were not to make it too regimented and unfriendly to our visitors and make the experience one they want to return to often. 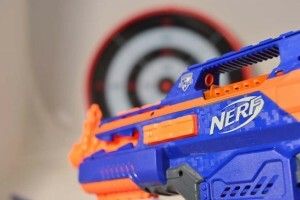 The fanatical foam dart players who are looking to expand their game play into bigger and better safe play scenarios are going to be pleasantly surprised on how wonderful our new idea is for both fun play and serious games for NERF Rival Blaster players and clubs. The concept is open play with all the latest high tech ‘Hasbro’ products being used for both Foam Dart and Foam Ball. Instead of offering a very basic ‘Nerf’ blaster from the extensive selection we have to offer we are letting the customer choose whatever they like from the entire range as long as they can operate it properly. If you are going to run an open style format then there is no limit on what type of blaster you use but you have to be age verified, able to hold it, load the darts/ball/discs and fire it to make the best use of your Blaster in game play. Training on blaster use is given, goggles and Full Face Masks for NERF Rival blasters are mandatory in game play whether in our venue, your garden, field or sports hall, with the emphasis on safety and fun at all times, paramount to a successful fun NERF Blaster Party.